Bought a set of these for my 6S when it was current. It was difficult to get seated properly. When it was on properly, the housing looked cockeyed against the phone frame. I tend to get a new phone every one or two years, and Apple keeps changing the shape and orientation of the lenses, so after a year or so you have to buy a new set off these things. Too much trouble and short useful life means I didn’t buy them again. Would like to see a comparison review of ‘clip-on’ telephoto lenses with 4x or better magnification. I noticed not too many companies make them - is it due to some inherent problem with using these lenses on phones, lense size or shakiness? I have a set of Olloclip lenses for my SE. Love them. Now, yes I do need to take the case off when I use them, but I can live with that. One question: My set has a 10X and 15X Macro. Both the Wide Angle and Fisheye unscrew to expose the Macro lens. The iPhone X set only has a 15X Macro. Does only one of the other lenses unscrew? I'm a little surprised they would have dropped the 10X, that's the closeup lens I use more. I was going to get one of these for my summer vacation trips. Based on the info in your review, however, I think I will pass. I don’t like the Face ID occlusion and not having the case on the phone especially when handling it while taking photos. I also really want a telephoto lens. Never going to buy one that does not work with FaceID... Plus iPhone X has to have a case, too much glass not to have one on all the time! Biggest problem for Olloclip...ALWAYS late to market. 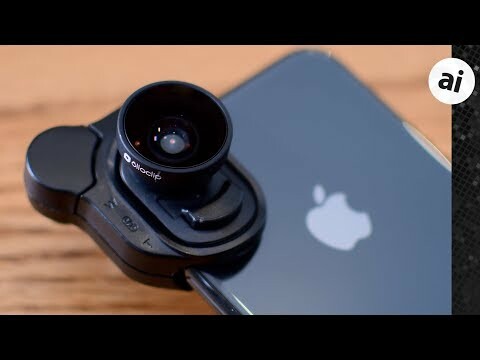 I'm sitting here thinking, I'd love to have one of these lenses...BUT come October I'll be upgrading to the new phone and there is 0% chance it will fit that phone. If these were available within the first weeks/first month of release then I bet their sales would increase. I'm not buying something that will be useless to me within 3 months. I think the author's comment about Face ID is a little misleading. Face ID is unavailable *only* when the front facing lens is covered by the Olloclip lens. If you're just using the rear lens, you do not also have to have another lens attached to the front.